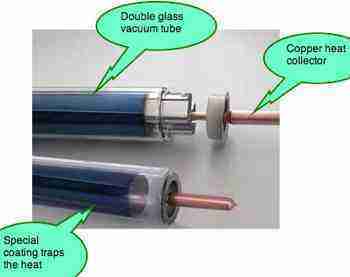 Passive solar water heater uses these inexpensive vacuum tubes. 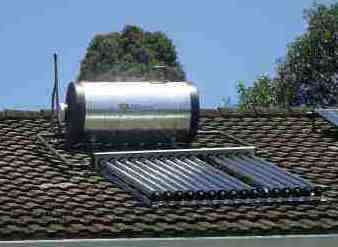 Passive solar water heater works on the thermosyphen principle and may be aided by a small pump. Planning your project takes a little aforethought. 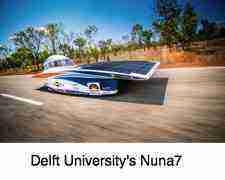 Firstly, are you wanting to go green? Is the cost not a big factor? Or are you trying to save money by building a homemade geyser? Where is the geyser going? We recommend on the roof rather than in the ceiling unless you live in subzero temperatures. This page was last updated on 14th November, 2018. I built my first homemade geyser some thirty years ago, and it worked tolerably well. They still use the thermosyphen principle; hot fluids rise by convection. It rises from a glass covered collector to a tank that must be at least half a metre higher. However, it wasn't terribly efficient and the copper pipes burst when cold weather set in. 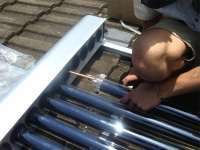 I wouldn't go that route if I were you as the effectiveness of a modern passive solar water heater can be greatly improved by using vacuum solar tubes at relatively low cost. About 20 dollars apiece, I wouldn't go any other way. 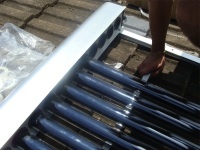 You will need an array of about 16 to 20 solar tubes. The total cost is about 3000 to 6000 dollars depending on taxes and the size of your installation. Something a lot more sophisticated is required in countries where the temperatures fall far below freezing. There seem to be in the main two types available. German, perhaps made in China with a European sticker, and those manufactured in the PRC. We have one of each. The former is a good deal more efficient but is also more expensive and difficult to source except through a dealer. I recommend the German tubes. I think made under the name Daimler. I just measured the midsummer temperature of the water; it's 80 degrees celsius, roughly 180 Fahrenheit; that's hot. A solar pump has some merit. And, whilst a passive solar water heater works, I was astonished how much more efficient my homemade geyser became when I added a small inexpensive pump energised by a PV panel. 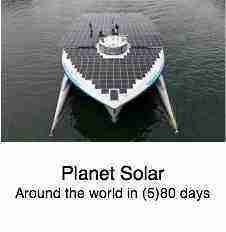 Costing around $60 + a 10W PV panel of around 30 dollars that drives the solar pump only when the sun shines. For less than 100 dollars you will be well pleased with the greatly improved temperature of your shower! Here's the basic solar system project. Now for a one year later update. 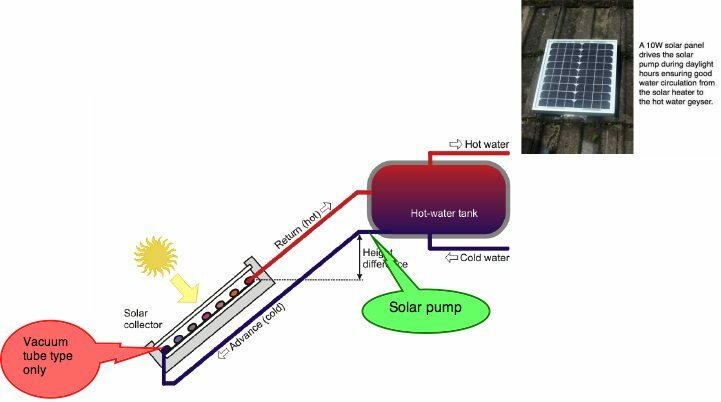 Having praised the solar pump, I think it needs further development. There are two options: a brass pump which is very expensive, and a plastic pump that is a quarter of the price but has limitations. 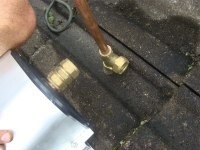 Noise, incompatible with general brass fittings, and ours leaked, flooding the roof, and only a six month guarantee. I wouldn't recommend. But, if your tank geyser is in the roof, and not much above the solar tubes, you have no option. The water in the manifold gets boiling hot, literally, and the sooner it cycles into your tank, the less the losses. 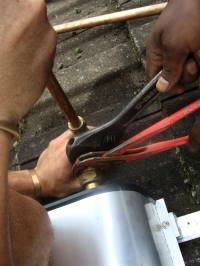 But the thermosyphen works extremely well if your geyser is on the roof, if the length of pipe from the solar tubes is short, and the height difference at least 300 mm. This is how you would construct your passive solar water heater. Firstly, you need a special geyser or hot water heater tank that has two extra inlet and outlet pipes for the aqua to pass to the solar tubes. Or, alternatively, an auxiliary tank from which the main geyser draws hot water. 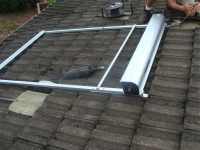 Ideally, the right time to install your homemade solar heater is in a new house, or when the unit needs replacing in any case. These high pressure geysers don't seem to last more than five to ten years. 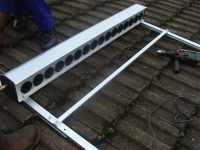 Having purchased your manifold and solar tubes, the first step is to assemble the frame on the ground. 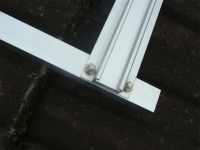 Having assembled the frame, carry the whole onto the roof, minus the tubes, and position it as close to, but as low down on the roof as possible to increase the thermo syphen effect. Choose a south facing aspect in the northern hemisphere, and conversely in Africa where I live. Ideally, if you live at 50 degrees north, you want to angle the solar tubes to about 50 degrees, or a little steeper for greater efficiency in the shorter winter days; but most folk would simply choose the pitch of the roof for convenience. Otherwise your frame has to be greatly strengthened. The whole structure must be firmly attached to the roof. 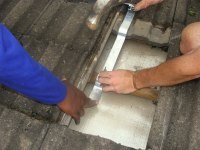 Remove some of the roof covering, in this case concrete tiles, and firmly screw two aluminium straps to the underlying roof trusses. Two for the top, and possibly also two extra for the bottom if you have extra high winds. Firmly attach the straps to your solar tubes frame. 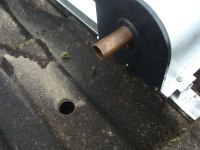 Having fixed the frame firmly to the roof, drill two small holes through the roof covering for the water pipes carrying to and from the solar tubes and the hot water tank. These holes need to be carefully sealed with a membrane and sealing paint to prevent rain leakage into your house obviously. Small air bubbles can collect in your solar system project, scuppering the whole exercise. A small valve allowing such air to escape is vital. 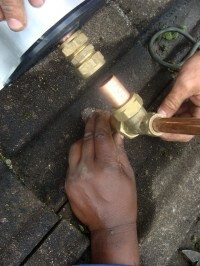 Purchase the correct plumbing fittings to connect to the solar tubes manifold, the valve, and the piping to the hot water heater tank. Make sure everything is neat and tight. 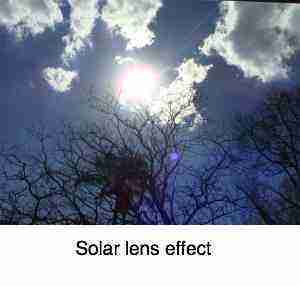 Photo voltaic panels turn the energy contained in light into a usable source of electricity. The solar pump must be driven by a 10W DC source. (Check your solar pump.) 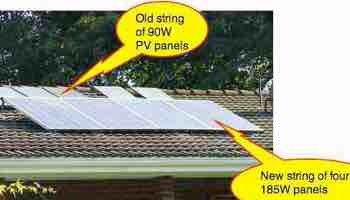 The simplest is a PV panel that will only come into effect when the sun is shining. 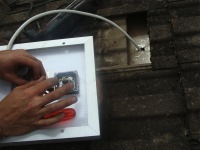 Because the voltage is relatively low, the wire connecting the panel to the solar pump must be as short and thick as possible. Losses are high. NB. The pump is DC and polarity is vital. Connect correctly to the panel, and to the pump. Epoxy the panel to the roof. More about that solar pump. Of course, once you insert a solar pump it's no longer purely passive. Let's call it an assisted passive solar water heater. 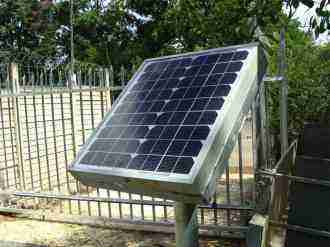 The solar pump naturally needs only to work during daylight hours, so it is driven by the 10W photo-voltaic panel. This greatly augments the thermo syphen affect and to my mind is an essential part of your system if your water tank is in the ceiling. The solar pump note is connected to the cold water return. 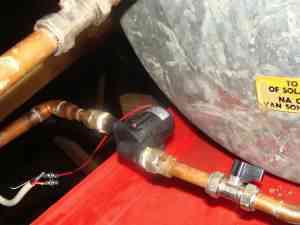 The liquid in your homemade heater can get extremely hot and long exposure to high temperatures may damage the device. Update: I confess I'm not enamoured with the solar pump available in South Africa. It's made of plastic and we've had leaks. A brass one is also available but very expensive. Moving the water tank above the roof definitely improved the whole performance. 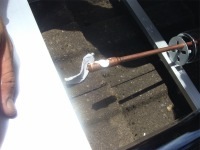 The heat from the solar tubes is carried up this copper rod to the water in the manifold. 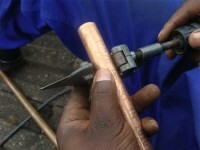 Ensuring a good seal and conduction a paste is applied to the end of the copper rod. The solar tubes for your assisted passive solar water heater are now fitted snugly into the plastic seal in the manifold housing. So, your passive solar water heater is complete. In a couple hours we'll go down and test the water temperature. Hot! Plenty hot enough for washing the dishes. If you only use a dishwasher, make sure it's connected to the hot water heater. Save you a bundle in electricity. A better option if you live in a country where it doesn't get bitterly cold (like northern USA) is to place the geyser on the roof. This certainly enhances the syphen effect, and does away with the solar pump. You will have noticed that one tube is missing. They have a vacuum jacket; if the vacuum fails, moisture gets into the tube, making it cloudy. Ours was faulty from day one, and has been returned to the manufacturer for replacement. 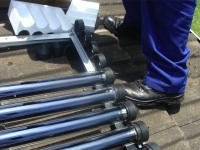 Moving the geyser to the roof has GREATLY enhanced the effect of these solar tubes. I recommend... geyser on the roof. A bit unsightly, yes. We almost never turn on the electric power to the geysers. 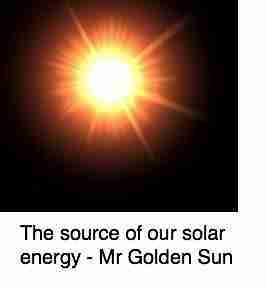 The next step, of course, in your aim to utilise all the free energy donated to you daily by the sun, is to turn those photons into free electricity; it's the second most important step after your passive solar water heater. How is that done? Not difficult if you follow these principles... Solar powered generator. Using our passive solar water heater and a solar powered generator we have reduced our energy consumption to 153 kWh in three and a half months (I've just checked). Just a little more than one kWh per day, and that includes the Christmas period when a lot of baking was done. We have an electric oven and gas hob. Installing your photo-voltaic panels is not difficult, with the help of a two friends. It took me four hours. You could also install your PVs yourself. 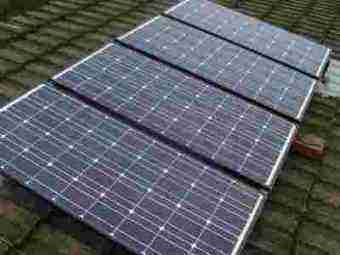 Follow these instruction at Solar generator installation. It's all about gathering heat from the infrared portion for your passive solar water heater, and electricity from the remaining part of the spectrum. 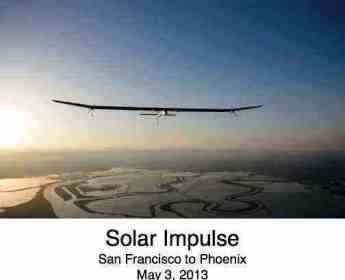 Solar panels where there's no mains power. Supplying high voltage current in the garden is both dangerous and expensive. 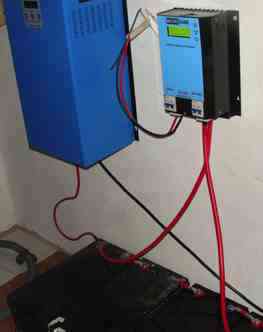 Residential solar panels come in small sizes too, for example for the supply of the battery that powers this gate motor. Solar power energy comes for free, a gift from Almighty God, but collecting and storing it, and turning into a water heater and useful electricity takes some thought and planning; and cost. Nevertheless it's an immensely worthwhile project, both to save money in the long run, and preserve the planet for your children's children. Passive solar water heater. Did you find this page useful? Then perhaps forward THIS PAGE to a fellow HOME DIY ENTHUSIAST. Bernard Preston is a retired chiropractor with a passion for the environment, and healthy living. That means building a passive solar water heater to reduce the need for electricity, saving rainwater and growing his own vegetables. 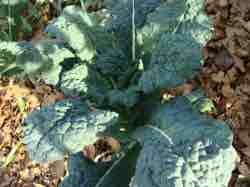 Kale is queen of the table, rich in the carotenes lutein and zeaxanthine that protect our eyes against age onset cataracts and macular degeneration. The regulator is on the right. 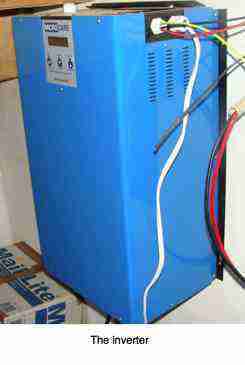 Heating water takes up fifty percent of your electricity. 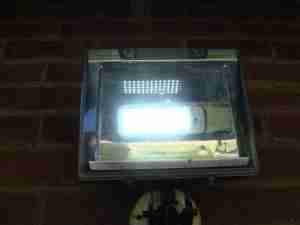 Light emitting diode lamps are a must.